It's like going without food for me. The first couple days are tough. Then, I forget I ever needed it. I'm most addicted to BGG when I have some spare cash and am in the market for purchasing games. Then I'm on 24/7 prowling the marketplace and GeekBay and the Geeklist Auction Metalist Geeklist. Yeah we get this in the UK too, a lot of the time on roundabouts. 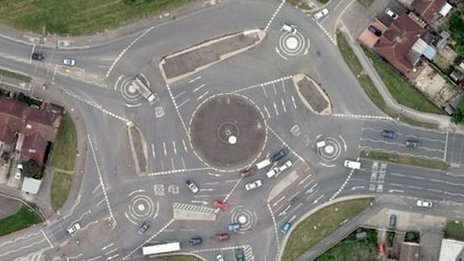 I know you don't really do roundabouts in the US but if any of you US folk have ever driven in the UK you'll understand the need for clear signalling on those things. It's either no signalling or people in the wrong lane cutting you up as you try to exit. Where I live - Carmel, IN - has more roundabouts that anywhere else in the United States. I actually really, really like them. They've actually been put in to make the community friendlier to pedestrian and bike traffic. One of the main divided highways through the community, Keystone Avenue, divided the community in half, so people who lived on one side couldn't really walk or bike to the other side safely - in typical Indiana exurban fashion, each intersection was wide and massive: standing traffic, no pedestrian signals, no sidewalks. So they lowered the road and ran "teardrop" roundabouts for the cross-streets over, using on and off ramps for turning traffic. 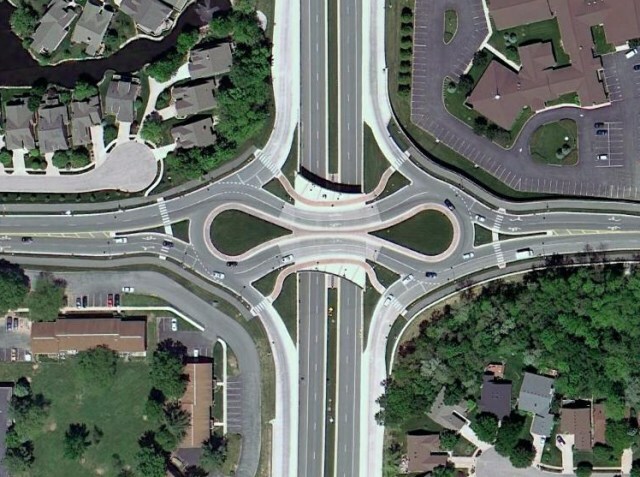 This allowed them to put bike and walking paths along the cross-streets and over the divided highway, making pedestrian and cyclist traffic across the divided highway much easier and safer. As well as reducing the sitting time for people commuting along Keystone who used to have to sit at half a dozen long lights. They did it for six intersections, and it's really brought the two "halves" of Carmel into contact with each other from a pedestrian standpoint. Anyway, this is the rants thread, and I've just spent a paragraph talking about how great something is. So, uh, what the **** is it with people who stop before entering a roundabout and then look to see if a car is coming? You're supposed to look at the traffic in the roundabout as you approach so you don't have to stop - not stopping is the point of the roundabout! Well, that and slowing down traffic through intersections so there are fewer fatal accidents. Yeah that really annoys me. That along with the social pressure to drive and own a car. I held out for a long time, I think it's probably a little easier because of the distances involved here but moving out of London and having children made it much harder. Dont enjoy driving though, and I still like the slower pace of walking, cycling and public transport. I hate public transit, but at least I don't feel like I'm likely to kill people.